Miami University Junior, Madison Ellis, was recently awarded the Three Arts Scholarship from the Three Arts Scholarship Fund Inc. in Cincinnati, Ohio. Each year hundreds of applicants from undergraduate schools within a 75-mile radius of downtown Cincinnati make application for the scholarship, but Ellis is the first person to win from Miami. And, she even won first place in the category of Drama. The Three Arts Scholarship Fund, Inc. is a non-profit organization that provides scholarships to undergraduate junior and senior females majoring in Music, Drama, or Art at universities near Cincinnati. The applicants present their talents to a panel of judges through a short video demonstration of their talent along with a letter explaining their future plans and need for financial help, a letter of recommendation from a major professor and a letter of character reference. The applicants who make it to the second round have to perform 8 -10 minutes of audition material to well-renowned judges in the area. Ellis choose to perform three monologues from Shakespeare, Guarre and Pinter. “I sat in on the Drama auditions and Madison was by far the best of the applicants,” said Lynn Klahm, secretary and board member at Three Arts. 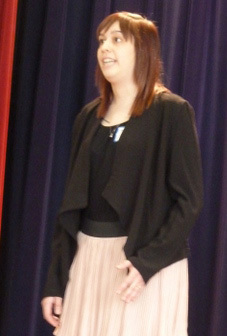 The judges were so impressed with Ellis' audition they requested to have her perform the scene from Ashes to Ashes for the organization’s Awards Recital and Luncheon. This year the organization awarded a total of $210,000 in scholarship money to 36 talented women in the area. The money was primarily funded through the late Louise Deterle Nippert by way of her foundation. Ellis is thankful for the generosity of the foundation and the opportunities that the winning of this scholarship has opened up to her. “The scholarship has given me an overwhelming amount of encouragement in studying the rewarding world of theatre. I am thankful for the support I have achieved in striving toward my dreams,” said Ellis.